Several villages were named in the reports of the battle, including Hussainiyah, Junaynah, Jiyah and Mayshiyah (Al-Jnenah, Al-Jee’a, Shamra al-Hisan and Hawiqa al-Maishiya). This reminds us of the Khasham raid in which pro-Syrian regime elements struck at SDF positions on the SDF side of the Euphrates river. In that battle on February 7-8 around 100 pro-regime fighters were killed when the US launched airstrikes. In addition Russian contractors were killed. The US later released footage of an airstrike on a Syrian tank on February 13. 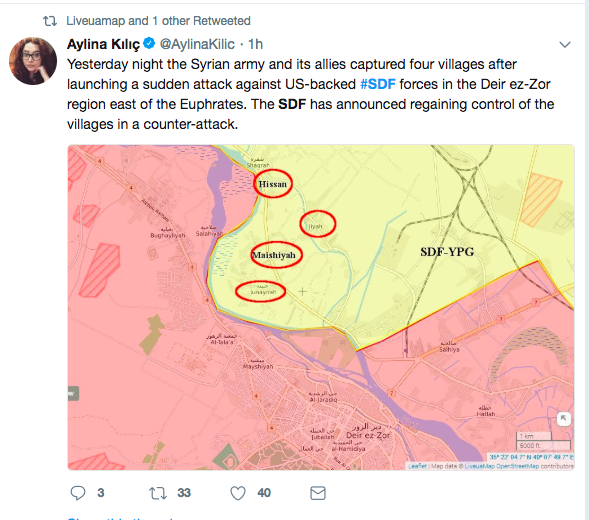 According to claims released by pro-SDF accounts the US has struck the NDF forces, however many details are unclear. Various maps claim to show the raid. One tweet claimed the SDF received support from the French and US. Civilians fled the fighting when it began in the morning. Wladimir van Wilgenburg tweeted that commander of the SDF Polat Can says regime attack was repelled. “The regime’s militias, allies and mercenaries were defeated in the towns of Deir Ezzor in the battle that broke out today when the regime attacked on the area north of the Euphrates River.” The SDF put up photos claiming it had completed the repulsion. There was also video of the SDF taking down a regime flag and showing a truck. 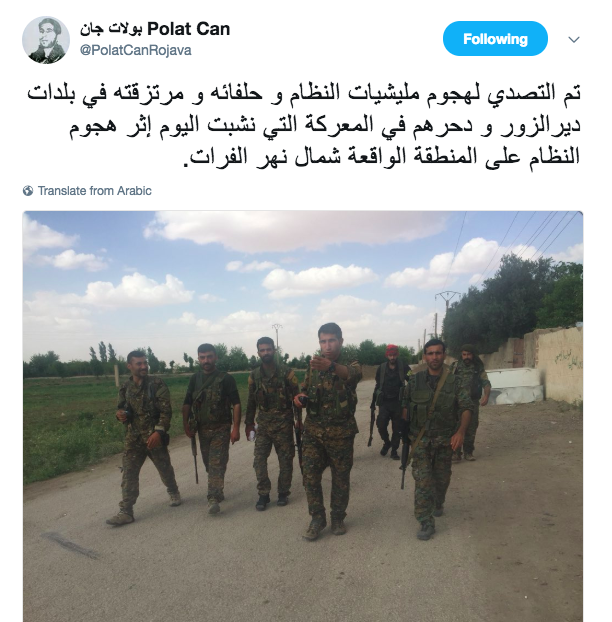 Pro-regime accounts initially claimed the SDF had abandoned the villages or that the residents had asked the SDF to leave. 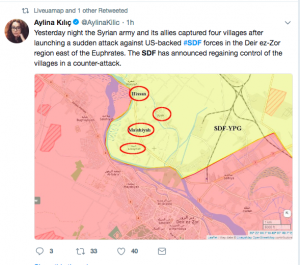 Others claimed it was important for the regime to test the US and SDF resolve. Sputnik even boasted of the capture.